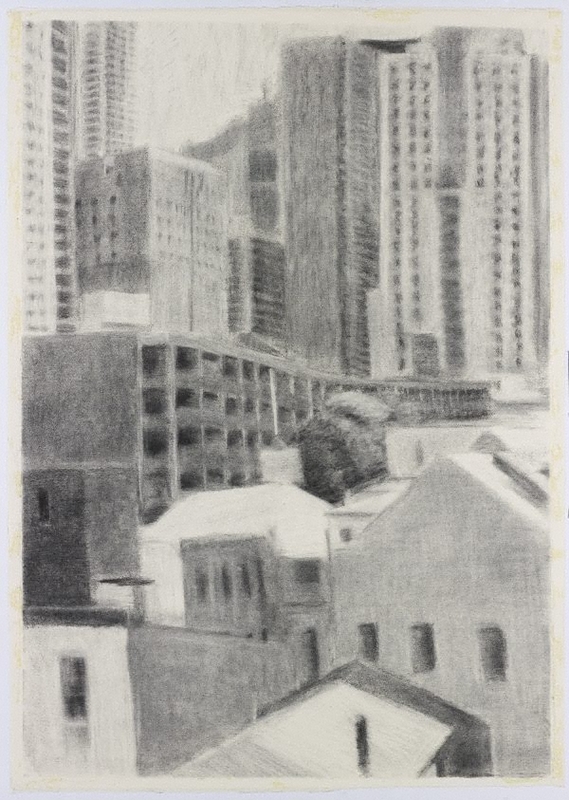 Sallie Moffatt studied at the National Art School from 1995-1997 and was selected for inclusion in the Portia Geach Portrait Prize and the Mornington Peninsula National Works on Paper Award in 1999 (and as a result a drawing was acquired for the collection via the Beleura-Tallis Foundation). She was also a finalist for the Brett Whiteley Travelling Scholarship in 1999. Sallie Moffatt finds all her subject matter by looking out the window of her home in an upstairs apartment of a building in a lane off Elizabeth Street, near Central Station. High-rise buildings in juxtaposition with terraces, a railway bridge or lamp post, in varying tones using charcoal, from rubbed-in grey to black to create the smoky light of the city precinct of Sydney have become her forté. This drawing was amongst the handful of outstanding inclusions in the Dobell Drawing Prize 2000 held at the Art Gallery of New South Wales. This work was acquired by the Gallery in 2000. Hendrik Kolenberg, The Dobell Prize for Drawing: 1993-2004 , ‘Introduction’, pg. 8-9, Sydney, 2004, 9, 45 (colour illus. ), 53. Anne Ryan, Look , ‘Paper collection’, pg. 12-13, Melbourne, Jul 2001, 12-13 (colour illus. ).